While Trump’s father was a wealthy real estate developer, Cohn’s father was an electrician. When Trump sought to get into the casino business, his father loaned him $14 million. When Cohn couldn’t find a job after graduating from college, all his father could do was find him one selling aluminum siding. While Trump has the instincts of a reality show producer and an eye for spectacle, Cohn prefers to operate in the shadows. But they likely recognize much of themselves in the other. Both Cohn and Trump are alpha males — men of action unlikely to be found holed up in an office reading through stacks of policy reports. In fact, neither seems to be much of a reader. Cohn told Gladwell it would take him roughly six hours to read just 22 pages; he ended his time with the author by wishing him luck on “your book I’m not going to read.” Both have a transactional view of politics. Trump switched his voter registration between Democratic, Republican, and independent seven times between 1999 and 2012. In the 2000s, his foundation gave $100,000 to the Clinton Foundation, and he contributed $4,700 to Hillary Clinton’s senatorial campaigns. He even bought and refurbished a golf course in Westchester County a few miles from the Clinton home, in part, Trump once admitted, to ingratiate himself with the Clintons. Cohn is a registered Democrat who has given at least $275,000 to Democrats over the years, including to the campaigns of Hillary Clinton and Barack Obama, but also around $250,000 to Republicans, including Senate Majority Leader Mitch McConnell and Florida Sen. Marco Rubio. There are also striking similarities in their business histories. Both have a knack for weathering scandals and setbacks and coming out on top. Trump has filed for bankruptcy four times, started a long list of failed businesses (casinos, an airline, a football team, a steak company), but managed, through his best-selling books and highly rated reality TV show, to recast himself as the world’s greatest businessman. During Cohn’s tenure as president, Goldman Sachs faced lawsuits and federal investigations that resulted in $9 billion in fines for misconduct in the run-up to the subprime meltdown. 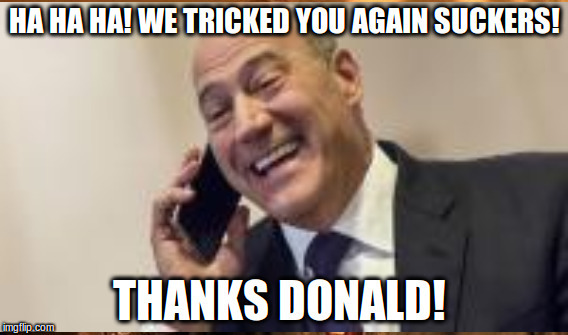 Goldman not only survived but thrived, posting record profits — and Cohn was rewarded with handsome bonuses and a position at the top of the new administration. Cohn’s path to the White House started with a tale of brass and bluster that would make Trump the salesman proud. Still in his 20s and stuck selling aluminum siding, Cohn made a play that would change his life. In the fall of 1982, while visiting the company’s home office on Long Island, he stole a day from work and headed to the U.S. commodities exchange in Manhattan, hoping to talk himself into a job. He overheard an important-looking man say he was heading to LaGuardia Airport; Cohn blurted out that he was headed there, too. He jumped into a cab with the man and, Cohn told Gladwell, who devoted six pages of “David and Goliath” to Cohn’s underdog rise, “I lied all the way to the airport.” The man confided to Cohn that his firm had just put him in charge of a market, options, that he knew little about. Cohn likely knew even less, but he assured his backseat companion that he could get him up to speed. Cohn then spent the weekend reading and re-reading a book called “Options as a Strategic Investment.” Within the week, he’d been hired as the man’s assistant. Cohn soon learned enough to venture off on his own and established himself as an independent silver trader on the floor of the New York Commodities Exchange. In 1990, Goldman Sachs, arguably the most elite firm on Wall Street, offered him a job. Goldman Sachs was founded in the years just after the American Civil War. Marcus Goldman, a Jewish immigrant from Germany, leased a cellar office next to a coal chute in 1869. There, in an office one block from Wall Street, he bought the bad debt of local businesses that needed quick cash. His son-in-law, Samuel Sachs, joined the firm in 1882. A generation later, in 1906, the firm made its first mark, arranging for the public sale of shares in Sears, Roebuck. Goldman Sachs’s influence over politics dates back at least to 1914. That year, Henry Goldman, the founder’s son, was invited to advise Woodrow Wilson’s administration about the creation of a central bank, mandated by the Federal Reserve Act, which had passed the previous year. Goldman Sachs men have played important roles in U.S. government ever since. There was the occasional scandal, such as Goldman Sachs’s role in the 1970 collapse of Penn Central railroad, then the largest corporate bankruptcy in U.S. history. Still, the firm built a reputation as a sober, elite partnership that served its clients ably. In 1979, when John Whitehead, a senior partner and co-chairman, set to paper what he called Goldman’s “Business Principles,” he began with the firm’s most cherished belief: The client’s interests come before all else. Two years later, Goldman took a step that signaled the beginning of the end of that culture. In the fall of 1981, Goldman purchased J. Aron & Co., a commodities trading firm. Some within the partnership were against the acquisition, worried over how profane, often crude, trading culture would mix with Goldman’s restrained, well-mannered way of doing business. “We were street fighters,” one former J. Aron partner told Fortune magazine in 2008. At the height of the dot-com years, a debate raged within the firm. The firm underwrote dozens of technology IPOs, including Microsoft and Yahoo, in the 1980s and 1990s, minting an untold number of multimillionaires and the occasional billionaire. Some of the companies they were bringing public generated no profits at all, while Goldman was generating up to $3 billion in profits a year. It seemed inevitable that some within Goldman Sachs began to dream of jettisoning the Goldman’s century-old partnership structure and taking their firm public, too. Jon Corzine was running the firm then — he would later go into politics in the Goldman tradition, first as a U.S. senator and then as New Jersey governor — and was four-square in favor of going public. Corzine’s second in command, Henry Paulson — who would go on to serve as Treasury secretary — was against the idea. But Corzine ordered up a study that supported his view that remaining private stifled Goldman’s competitive opportunities and promoted Paulson to co-senior partner. Paulson soon got on board. In May 1999, Goldman sold $3.7 billion worth of shares in the company. At the end of the first day of trading, Corzine’s and Paulson’s stakes in the firm were each worth $205 million. Cohn’s and Mnuchin’s shares were each worth $112 million. And Blankfein ended up with $168 million in company stock. Like any publicly traded company, there would now be pressure on Goldman Sachs to make its quarterly numbers and “maximize shareholder value.” Discarding the partner model also meant the loss of a valuable restraint on risk-taking and bad behavior. Under the old system, any losses or fines came out of the partners’ pockets. In the early 1990s, for example, the firm was involved in transactions with Robert Maxwell, a London-based media mogul who was accused of stealing hundreds of millions of pounds from his companies’ pension funds. The $253 million that Goldman Sachs paid to settle lawsuits brought by pension funds over its involvement was split among the firm’s 84 limited partners. Now any losses are paid by a publicly traded entity owned by shareholders, with no direct financial liability for the decision-makers themselves. In theory, Goldman could claw back bonuses in response to executives’ bad behavior. But in 2016, when Goldman paid over $5 billion to settle charges brought by the Justice Department that the firm misled customers in the sale of a subprime mortgage product during Cohn’s time overseeing that unit, the Goldman board declined to dock Cohn’s pay. Instead, the company awarded him a $5.5 million cash bonus and another $12.6 million in company stock. As Blankfein moved up the corporate hierarchy, Cohn rose along with him. When Blankfein was made vice chairman in charge of the firm’s multibillion-dollar global commodities business and its equities division, Cohn took over as co-head of FICC, Blankfein’s previous position. That meant Cohn was overseeing not just J. Aron and the firm’s commodities business, but also its currency trades and bond sales. By the start of 2004, Blankfein was promoted to president and COO, and Cohn was named co-head of global securities. At that point, Cohn had authority over the mortgage-trading desk. Under Cohn, the firm aggressively moved into the subprime mortgage market, using Goldman’s own money and that of its customers to help stoke the housing bubble. Goldman was already enabling subprime predators, such as Ameriquest and New Century Financial, by providing them with the cash infusions they needed to scale up their lending to individual home buyers. Cohn would steer the firm deeper into the subprime frenzy by setting up Goldman as a patron of some of these same mortgage originators. During his tenure, Goldman snapped up loans from New Century, Countrywide, and other notorious mortgage originators and bundled them into deals with opaque names, such as ABACUS and GSAMP. Under Cohn’s watchful eye, Goldman’s brokers then funneled slices to customers they sold on the wisdom of holding mortgage-backed securities in their portfolios. One such creation, GSAA Home Equity Trust 2006-2, illustrates Goldman’s disregard for the quality of loans it was buying and packaging into security deals. Created in early 2006, the investment vehicle was made up of more than $1 billion in home loans Goldman had bought from Ameriquest, one of the nation’s largest and most aggressive subprime lenders. By that point, the lender already had set aside $325 million to settle a probe by attorneys general and banking regulators in 49 states, who accused Ameriquest of misleading thousands of borrowers about the costs of their loans and falsifying home appraisals and other key documents. Yet GSAA Home Equity Trust 2006-2 was filled with Ameriquest loans made to more than 3,000 homeowners in Arizona, Illinois, Florida, and elsewhere. By the end of 2008, 65 percent of the roughly 1,400 borrowers whose loans remained in the deal were in default, had filed for bankruptcy, or had been targeted for foreclosure. In just three years, Goldman Sachs had increased its trading volume by a factor of 50, which the Wall Street Journal attributed to “Cohn’s successful push to rev up risk-taking and use of Goldman’s own capital to make a profit” — what the industry calls proprietary trading, or prop trading. The 2010 Journal article quoted Justin Gmelich, then the firm’s mortgage chief, who said of Cohn, “He reshaped the culture of the mortgage department into more of a trading environment.” In 2005, with Cohn overseeing the firm’s home loan desk, Goldman underwrote $103 billion in mortgage-backed securities and other more esoteric products, such as collateralized debt obligations, which often were priced based on giant pools of home loans. The following year, the firm underwrote deals worth $131 billion. In 2006, CEO Henry Paulson left the firm to join George W. Bush’s cabinet as Treasury secretary. Blankfein, Cohn’s mentor and friend, took Paulson’s place. By tradition, Blankfein, a trader, should have elevated someone from the investment banking side to serve as his No. 2, so both sides of the firm would be represented in the top leadership. Instead he named Cohn, his long-time loyalist, and Jon Winkelried, who also had history on the trading side, as co-presidents and co-COOs. Winkelried, who had started at Goldman eight years before Cohn, had probably earned the right to hold those titles by himself. But Cohn had the advantage of his relationship with the CEO. Blankfein and Cohn vacationed together in the Caribbean and Mexico, owned homes near each other in the Hamptons, and their children attended the same school. Winkelreid was out in two years. The bromance between his fellow No. 2 and the top boss may have proved too much. Unbelievable Trump: instead of chasing the banksters, he puts them in key positions!